Inspiring blue hues that you’ve got to try. A new season is generally a time of transition in nature, in life and in hair trends, too. While change is often a sign of growth and new potential, it can also be challenging sometimes. Whether you’re graduating from college this month, starting a new job or moving into a new place, we know that even endings that also serve as new beginnings can be a little bittersweet. 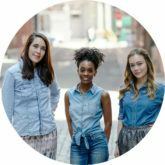 Here at All Things Hair, we consider our hair as one of our defining features and as our lives are in a state of transition, our hair often reflects that, too. As you think about switching up your hair during this season of change, why not beat the bittersweet blues by embracing the awesome blue hair trend. 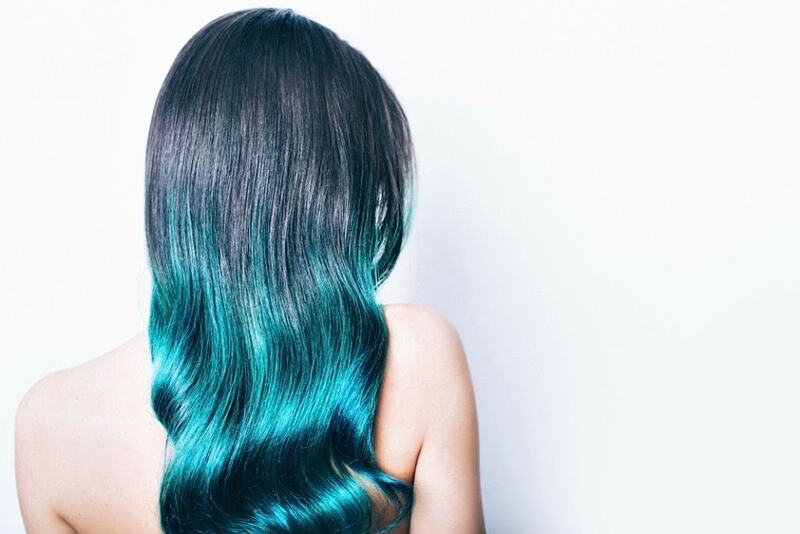 Blue hair has been making a comeback and we can’t get enough of this deep, icy trend. Whether you want to dye your whole head of hair blue, or simply opt for blue highlights or blue hair ombre, there are endless ways to give this trend a try. Keep reading for some of our favorite dark blue hair color ideas for some major style inspiration this season. Navy blue hair paired with a bowl cut is giving us serious ’70s throwback vibes. If your hair is naturally dark, going for a darker navy blue will ease any growing out roots anxiety. This cotton candy combination is one of our favorite blue hair color ideas since it’s so multifaceted. Show off the different colors in your hair with french braided pigtails that’s sure to gorgeously accentuate your face. Denim doesn’t have to be a fashion only style staple. 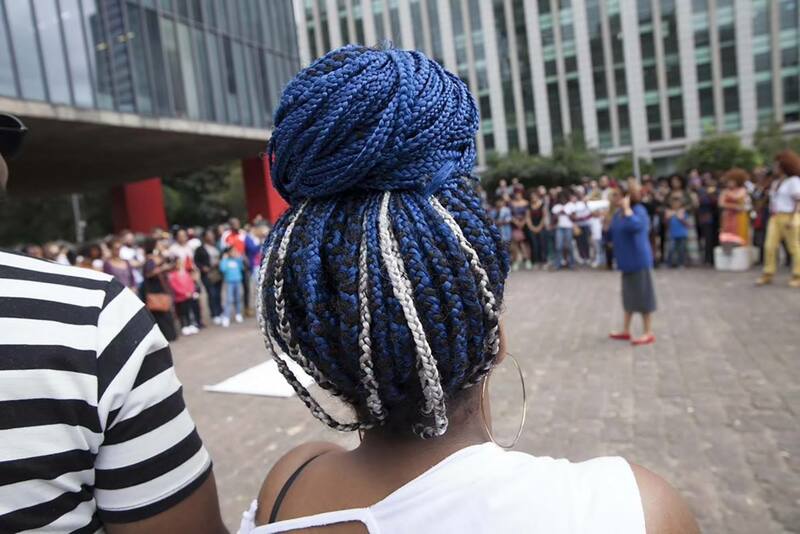 Choosing a medium cool blue with white streaks gives the perfect denim look to your braids. Styling your hair into a big top bun is also a great way to show off your edgy new blue hair color. 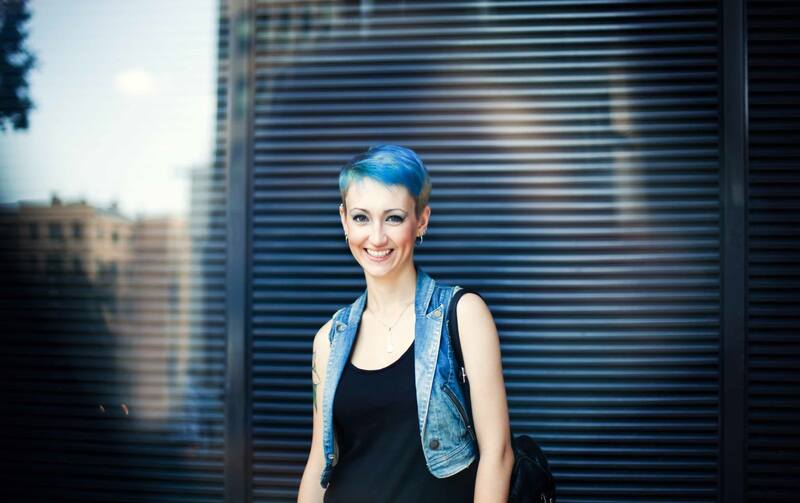 Add multiple layers of blue hair to your pixie. To keep things interesting, layer multiple shades of blue in your hair. This light blue to darker blue monochrome look is a stunner. If you have lighter roots we suggest you keep the lighter blue towards the roots and layer to a darker blue through the ends. For a high fashion look, try this mermaid light blue. Incorporating greens with blue tones keeps this blue light and airy. Add to your beachy look by air-drying your hair, followed up with some sea salt spray for a tousled, texurized look. If you’ve been rocking the gray hair trend, freshen your color with a wash of blue. Try out out a temporary color to test out if this hue is right for you. 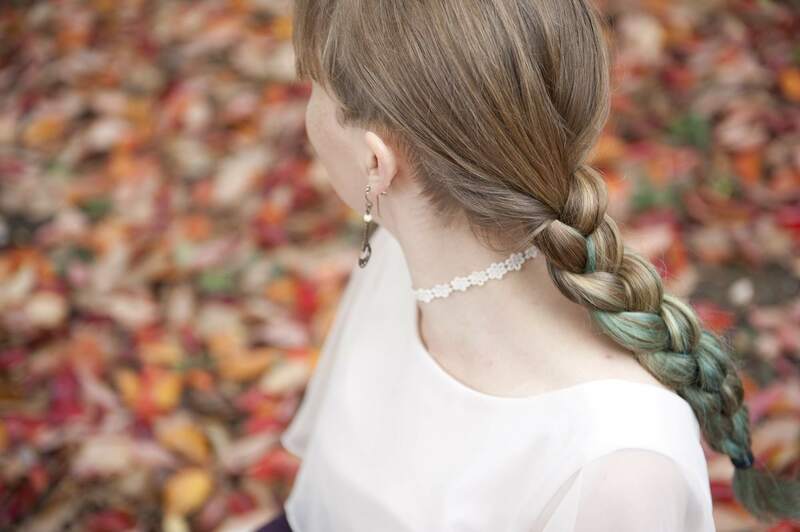 This is one of our favorite pastel hair variations. Has your pastel color obsession already reached unicorn levels? Then dyeing all of your hair a light aqua color is the next step for you. This option isn’t great for the general health of your strands as it requires bleaching your hair to a light enough color that will allow optimum vibrancy, but the end results are breathtaking. This hair color looks beautiful when swept up into more intricate styles but makes a statement even when you simply air dry your hair. Maintain this vibrant color by swapping out your usual shampoo and conditioner for the Dove Nutritive Solutions Color Care Shampoo and the Dove Nutritive Solutions Color Care Conditioner. This style is so subtle that it’s almost indiscernible. If you’re not yet ready to commit to a head of blue hair then this might be the best option for you. Strategic placement of icy blue highlights in the bottom half of your hair give the illusion of thin threads of blue cascading down. These highlights are so thin and light that you might miss them altogether at first glance. Let the contrast do all the talking. This grown-out style utilizes the contrast of darker roots to make the blue color pop even more. The best part about a style like this is that when it comes to upkeep it’s relatively low maintenance. Consider a bolder version of one of our favorite trends. 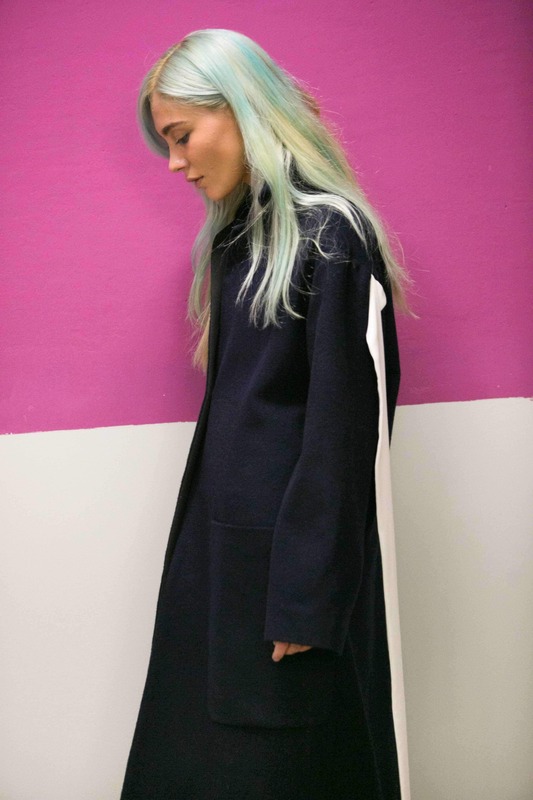 A great way to balance a more classic style with blue hair is by opting for a blue ombré. Ombré hair is one of those trends that’s here to stay. Maintaining your natural color around your hairline keeps this style a little more conservative while the pop of blue on the ends still allows you to embrace this trend. We find that this style looks best with a wavier texture as it blends the two colors more easily. A hair product like the Suave Professionals Texturizing Sea Salt Spray will enhance your natural texture for beautiful waves. 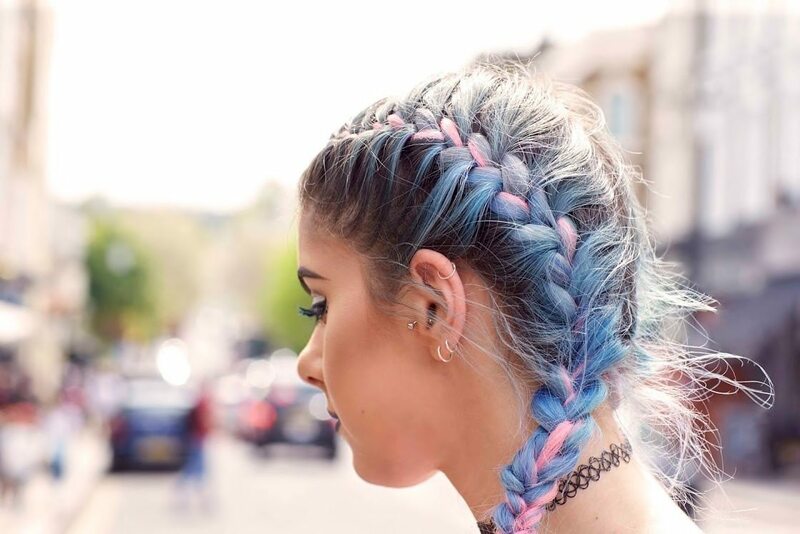 Combine an undercut with icy blue strands. This style includes two bold trends wrapped up in one killer style. 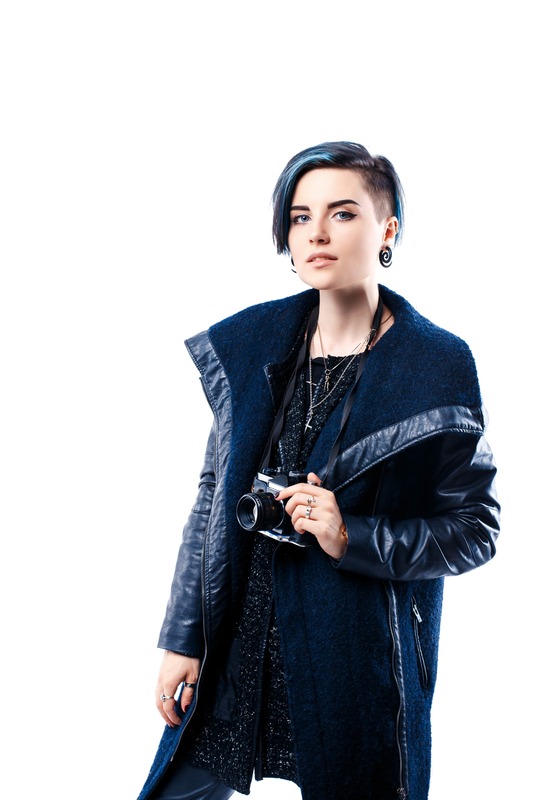 An undercut streaked with royal blue highlights is one of the boldest variations we’ve found. Keep the longer parts of this style silky smooth by running a dime-sized amount off some serum throughout your strands. Get a look that does both! Work two trends in one—blue hair color on a shag—and opt for a deep royal shade to go with all the layers. Worn with a straight texture, the color lends the look a grungy, alt-kid feel; worn with waves or curls, and it’s more hippie-chic. A dry shampoo that’s made for colored locks, such as Suave Professionals Keratin Infusion Color Care Dry Shampoo, also helps refresh on the go when things get a bit too stringy. Curly, natural-textured hair is taken to the next level with a shock of single-process color. 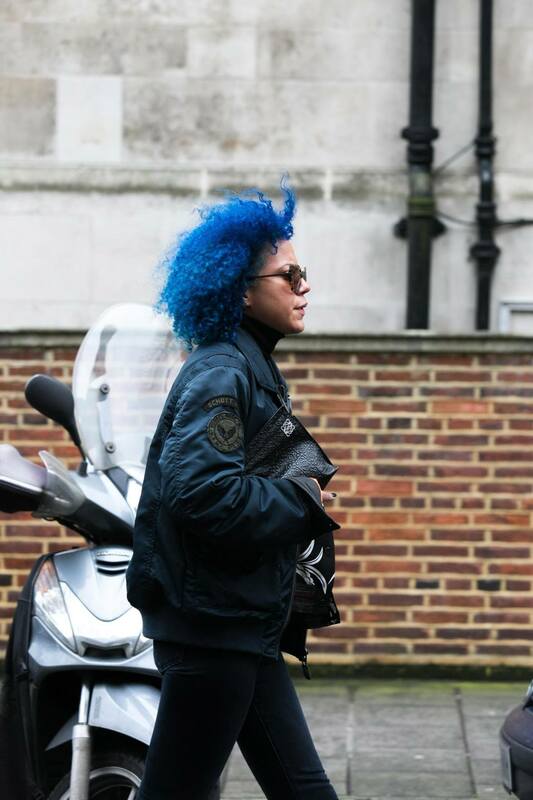 Unapologetically different, a blue hair color afro is sure to turn heads on the street. If you’re confident enough to pull off this look, don’t skimp on the deep conditioner—bleach can be very damaging on natural hair. We like the potent yet non-greasy nourishment we get from a weekly mask. We love the ’90s throwback feel of a nice baby fringe. Another one-two shot of chic comes in the form of blue hair color with a set of baby bangs. This look was admittedly the dark horse of the year, as we never really saw this one coming. However, runway darlings and savvy street-style stars (as well as a celebrity or five) have proven us wrong and schooled us in the art of rocking the micro fringe. Bonus: It’s totally beanie-friendly! Creative forward-thinkers and artistes in general, listen up: We think this baby-blue stain on platinum blonde hair might just be up your alley. Some women like the look of a blue wash on blonde hair and actually try to achieve this look on purpose, while some start out with a darker blue and allow it to leech out naturally. Either way, keep that shine intact with a monthly glossing treatment that helps keep looking polished even if your color is, dare we say, abstract. Get the best of both worlds with punky dip-dyed locks. This shade—a midway between green and blue hair—gives a great contrast to brunettes and auburns, as well as bright jewel-toned makeup. It’s a fresh departure from natural-looking highlights and suits those who definitely want to make a statement, but still want to be free to tuck it up in an updo when the need arises. Peekaboo highlights, or highlights on the underside layers of hair, gain an ombré-like effect when concentrated towards the ends. They’re also a tongue-in-cheek wink to an otherwise run-of-the-mill hair color, and result in a look with tons more personality. Styling it in a half-updo definitely makes the blue hair in this look pop, and braids and twists also maximize the streaky effect of this hairstyle. A color primer also helps repel water in the shower and extend your highlights longer. Over-the-top? Yes. Charming? Yes! Who woulda thunk that wearing pink and blue hair, outside of a gender-reveal baby shower, would be anything other than a faux pas? But when rendered with a kitschy, unserious vibe—the side-shave and natural-texture top knot makes this 100% directional—and it’s a look that knows it’s having fun, and invites you to play along. 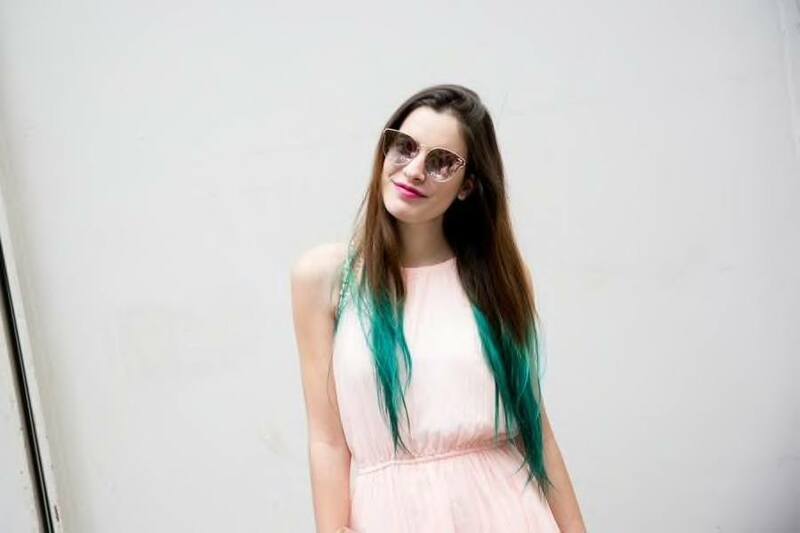 Or maybe blue ombre is more you thing? Read on to check out more about this trend. What is Blue Ombré Hair? Colored blue hair needs weekly conditioning treatments to maintain its sheen. A take-off from ombré, or the trend that took 2013 by storm, is blue ombré hair. It’s pretty much what you imagine it to be: graded highlights that are darkest near the root and go lighter towards the ends… but in blue. Yup: Instead of those luxurious-looking light browns or honey blonde balayage jobs, we’re now dealing with base colors such as navy, indigo or cobalt. These colors then lighten to hues of aqua, turquoise, baby blue and even silver and white. We’ve now graduated from merely wanting to look like we holidayed in St. Tropez to full-on fairy princess. Our take: Fair enough! There have been tons of different interpretations of this trend both online and in real life, with women using everything from wash-out dyes to hair mascaras to colored hair extensions. The best, most jaw-dropping results though have always come from those committed to the look—we mean straight-up permanent color, bleached and toned to perfection, and done in cascading ringlets for a daring, unapologetic modern siren effect. And once you’ve gotten over the usual hurdles—your job, your mom, your man, your bank account—and still think, after everything, that you were just born to be blue, then more power to you! It’s a subversive yet feminine color that definitely isn’t for the faint of heart. And just like it is with going platinum blonde, if you can put up with the upkeep of blue ombré, then you definitely deserve the head-turning attention afterwards. 1. Pick a shade of blue that fits your personality and that you really, really love (since, well, you’re already going out on a limb here). Fancy yourself a true sapphire or royal blue that lightens to a pale periwinkle? Or are you looking for a subtler take, like a Prussian navy that saturates up to an azure blue at the tips? Do your research, and take your current looks and lifestyle into account. 2. Have it professionally done, at least at first. More and more salons have been getting candy-hair requests these days, so there’s no reason to feel embarrassed or patronized when requesting for blue ombré strands. This is also the time to put your Instagram and Pinterest skills to good use and take screenshots of that salon’s feed or of certain looks you admire. Note: Choose photos of women with similar coloring as yours as much as possible. Unless the look you’re going for is all-over mermaid, full stop, some highlights can give your look a more sophisticated dimension and ease you into the fading process. Because, spoiler, blue fades into greenish gray, and it fades fast. 4. So invest in a color-safe shampoo. That said, switch out your regular sudsy shampoo and conditioner with color-safer versions, like TRESemmé Color Revitalize Shampoo and TRESemmé Color Revitalize Conditioner (these formulas can help maintain your color’s vibrance for up to 8 weeks!). If you used to be a bleached blonde, a purple shampoo, like Bed Head by TIGI Dumb Blonde Purple Toning Shampoo, can come in handy when fighting brassiness, especially after a dip in the pool or a day on the beach. 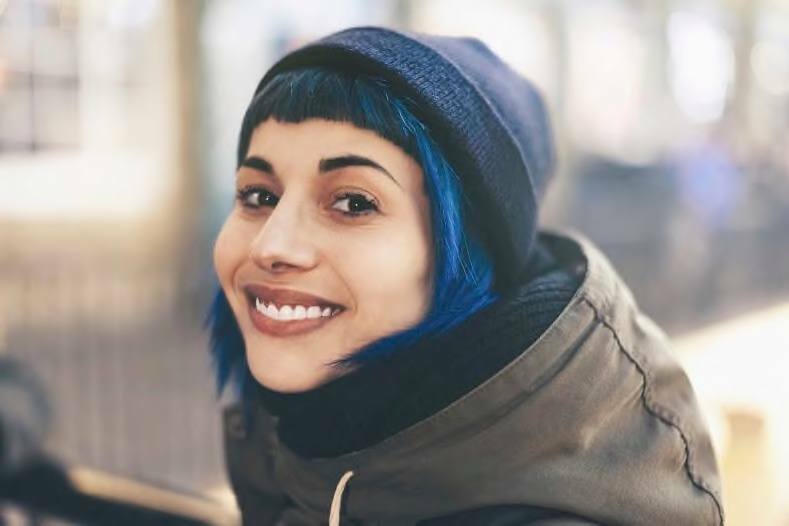 Alternative hair colors such as blue, green or purple—especially when worn without highlights or a glaze—can appear flat and may show damage more than your natural brown or blonde, since most natural colors aren’t actually one-tone. A regular dusting off of frayed ends every six weeks can keep your mane looking healthy. 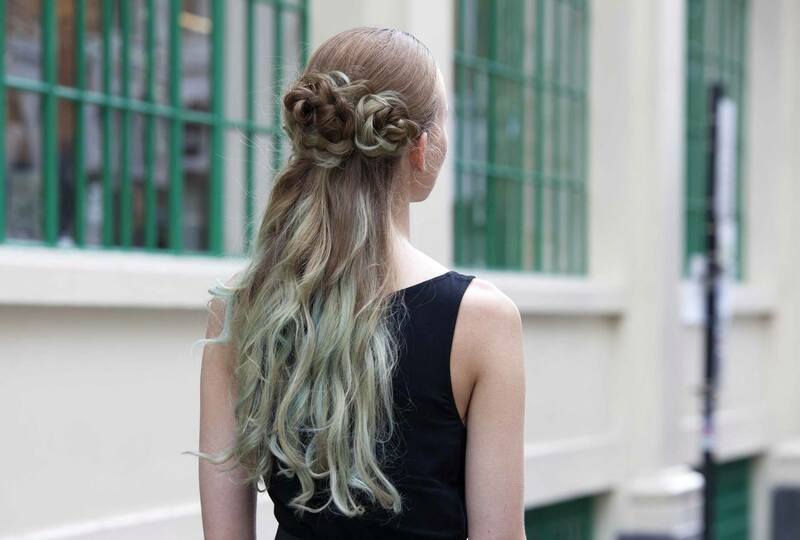 Also, master curling your ends—it’s a gorgeous look on fairy-hued hair. 6. Wash infrequently and deep condition whenever you can. The less you wash, the less you traumatize your locks. Most hair shades can’t lift to a true blue unless stripped off their natural color via bleach, so it’s safe to say your strands will be overprocessed. Treating them to a bi-weekly, at-home, deep-conditioning treatment can help improve the texture and manageability of damaged strands. And use a heat protectant before you blow-dry or flat iron! 7. Do your due diligence. Lastly, maintaining this color the moment your roots come in is crucial to looking polished. You can definitely get more delinquent with touchups if you want a grungier, more grown-in feel, but if you want to keep that awesome ’do looking fresh, make sure to squeeze in that appointment every six weeks as well. Looking for more hair color trends? 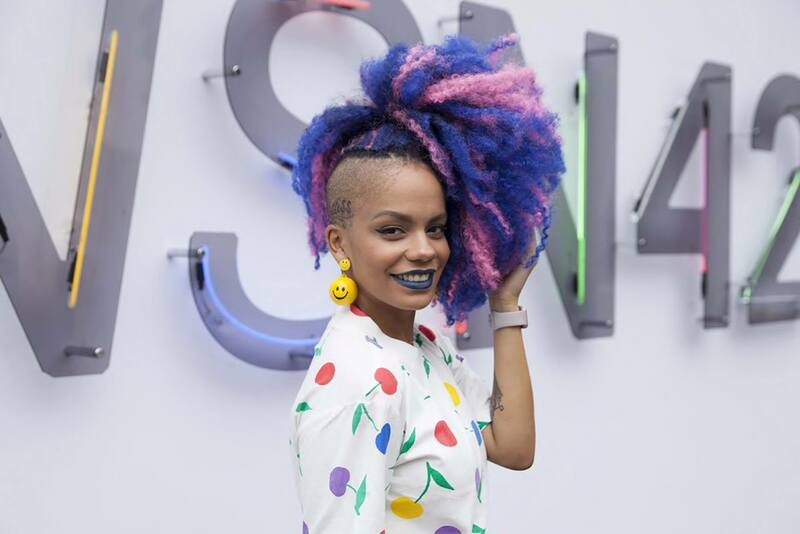 Check out our roundup of the hot unicorn hair trend.